You can find a Spanish version of this review in Friedhof Magazine, an extreme metal magazine. It’s thanks to them that I got it, and they are kind enough to let me republish this on my personal site. “The March Through Crimson Frost” is an album which requires to be listened to quite a few times before you can make a judgement on it. You could blame this on production. It sounds like someone had sit over the equalizer knobs, creating a tonal disparity that is disorienting, if nothing else. A new studio, or at least a new sound tech would do much good for this irish boys. First one’s the bass. Fast, precise, and certainly complex. Quite interesting from my point of view as an amateur bassist. It’s very far from the typical supporting lines, and often the driving force behind the melodies, leaving the guitar behind. Then, there’s the voice. Appalling, but not in a good way. The album is voiced by the bassist, and his excelent performance on the strings doesn’t extend to singing. The clear register which he uses sounds, for me, too nasal and a bit too high, and doesn’t live up to the rest, grounding what could’ve been a very well rounded work. I’d daresay that an instrumental album would have been something to think of, at least while they’re short of a singer with a wider register. The design of the cover -complete with menhir and celtic knotting frame- along with the irish origin of the band hints about a sound that you will not find in the 38 minutes length of “The March Through Crimson Frost”. Having been described by the band themselves as Celtic Thrash, the record could be disappointing for those who like either celtic music or Thrash Metal. It is not that the album is bad in any way, it’s just that Celtic Thrash is a hard mix to get right. 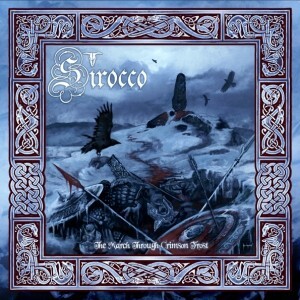 Sirocco, though, has managed to execute it with a great dose of raw talent, and more success than you could expect. Siguiente Entrada siguiente: ¿Ultimátum a la tierra?